In 2017, the car of choice for most classic car tours and day trips is the Jaguar MK VII M. However I have finally bitten the bullet and upgraded to electronic ignition. This followed a three day trip to Shropshire during which the mighty VII M spluttered to a silence no less than four times. On one rather embarrassing occasion this happened in the packed car park at Ironbridge but thanks to a group of rather bewildered looking tourists the ton and a half of Jaguar was rolled into a parking space and out of the way. I’m just amazed that the car decided to conk out about 30 yards from possibly the only vacant space on a very busy spring weekend when Ironbridge was teeming with visitors. After much removing, filing, refitting and gap setting of points performed by Martin, my faithful fellow traveller/ navigator, who also happens to be a mechanic with forty years experience, we actually made it through the trip with the existing set and for a while, a spare set I had in the boot. These appeared to have come from a rather bad batch so were immediately binned. Just as a precaution, from the hotel the following morning, I ordered a new spare set just in case we needed an option, so many thanks to the fine people at Dingocroft (an excellent Land Rover spares outlet in Downley near High Wycombe) for sending them out toute de suite to arrive the next day. Anyway that set will now go into the series Land Rover spares box as the Jag now has a new electronic distributor fitted and although I haven’t driven very far with this set up, all seems to be working splendidly at the moment! The first of several unscheduled stops! The BGT has been providing excellent service as everyday local transport all year round and has also taken me on some not so local trips since being re-commissioned. 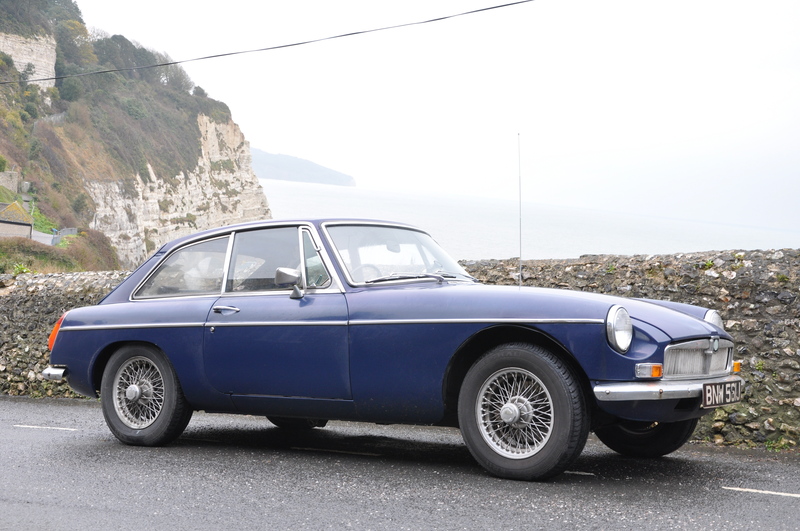 On one 300 mile day trip, she was in the company of an E-Type and an XK140. She more than held her own against the two Browns Lane boys and once again proved why the all round capability of the MGB has made it so popular. Apart from a thorough service, mechanical work has been limited to a new pair of front springs as the old ones appear to have been worn ever since I bought the car and made it sit far too low. Someone recently thought that it was sitting too high at the front, but it handles and steers well and looks great – I’m happy. This car is consolidating its position at the vanguard of the fleet. 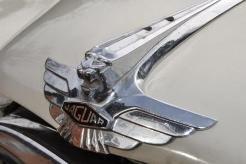 My admiration, nay deepening love, for these fabulous big Jaguars remains undiminished. Mechanically the car is now fully sorted and the o/d unit was the final challenge. We have spent countless hours playing with switches, relays and solenoids – all with only partial success. Here was a bullet waiting to be bitten- the o/d unit would have to come out. 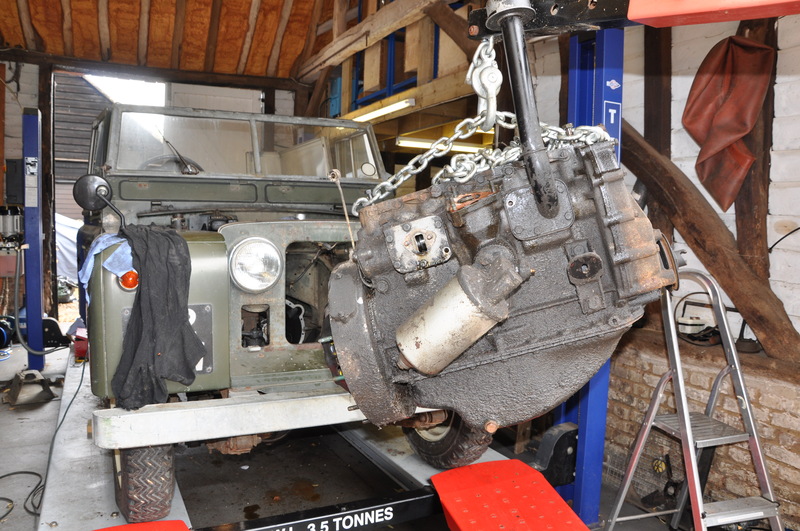 Now to do this it is recommended that the engine is taken out first, followed by the gearbox. 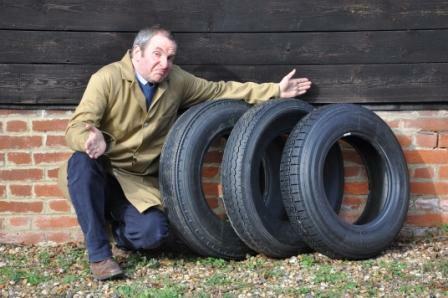 Fortunately, due to a chassis ‘modification’ made prior to my ownership (see photo! ), with much care and patience the unit can be eased out from underneath without removing the engine and gearbox – actually I’m not entirely sure ‘eased’ is the right word here. As the Laycock manufactured parts of Captain Edgar de Normanville’s magnificent invention (Edgar was British by the way – don’t be fooled by the ‘de’ and the ‘ville’ bits) were laid out on the bench – we decided that inspection and reassembly should be carried out by a specialist who works with these units every day. Our biggest challenge turned out to be refitting it to the car with everything else in situ. So, while taking the not inconsiderable weight of the unit, we needed to ensure that the splines in the unidirectional clutch and planet carrier were in alignment and in a position to receive the mainshaft. We then had to keep the clutch springs (all 12 of them) over their respective bosses and start tightening the first two nuts, drawing the o/d casing towards the gearbox rear extension. With ¾” to go we had to enter two long bladed screwdrivers, one to compress the oil pump plunger and the second to lever the cam into alignment with the plunger roller while steadily tightening the nuts. Simple really. After our second attempt we experienced that sense of disbelief which comes from achieving something that could well have frustrated us to the edge of sanity. It would soon be road test time. Overdrive transforms the MKVII and on the way up to the NEC in April, the eurohatches and their occupants seemed rather shocked by the sight of a ton and three quarter of sixty year old Glory storming past them, utterly relaxed at 70 plus cruising speeds. As I’ve said before, these are wonderful cars…. 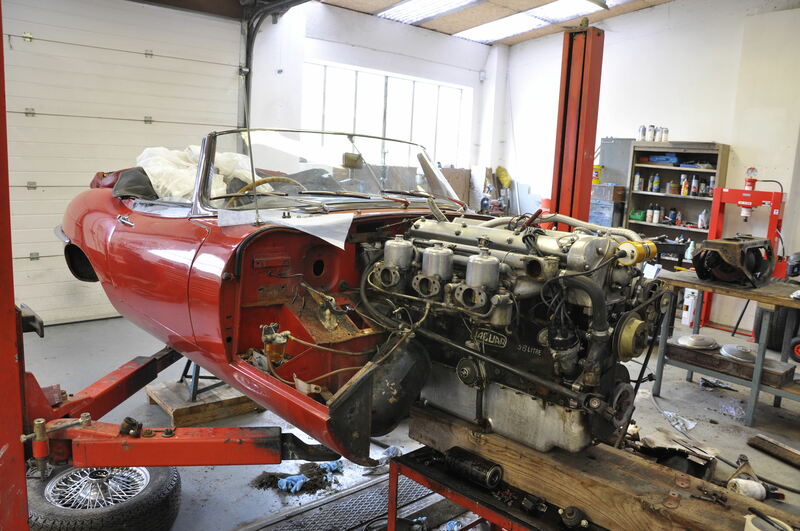 It started out as an investigation into an engine problem and turned into a partial restoration. 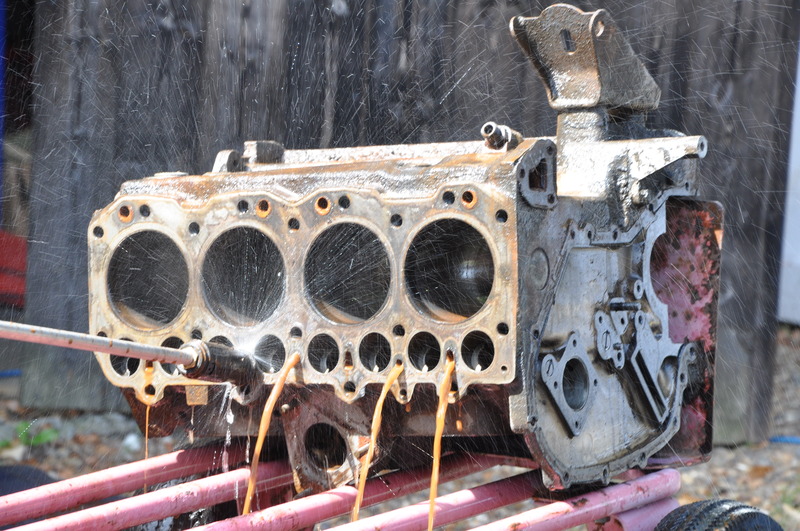 On closer inspection of the motor, burnt out valves were discovered and after we had removed the cylinder head, compression and oil/paraffin bypass tests confirmed that there was indeed wear in the bores. 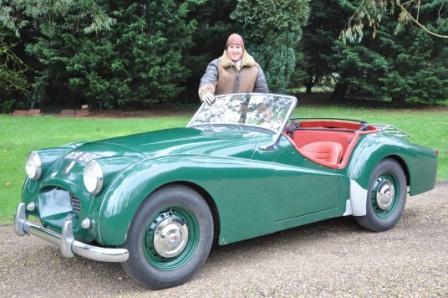 So I decided that this original and relatively unspoilt ’61 vehicle deserved an injection of effort and cash. A few weeks later, the rebored block incorporating a reground crank was reunited with the reconditioned, unleaded head, and the motor, looking glorious in a fresh coat of admiralty grey, was ready for more sterling service. One slight headache was the water pump which was well worn. The correct rebuild kit was unavailable so, with the invaluable help of Steve at Langley Components (Maidenhead), a kit for a later pump was modified and a new impeller machined to fit. Problem solved. The radiator was reconditioned. It is possible to fit a repro Series III item but for me it just had to be the original with the ‘Serck Radiators Ltd Birmingham’ plate sitting on top. I managed to obtain one of a rapidly dwindling supply of new old stock solex carbs. 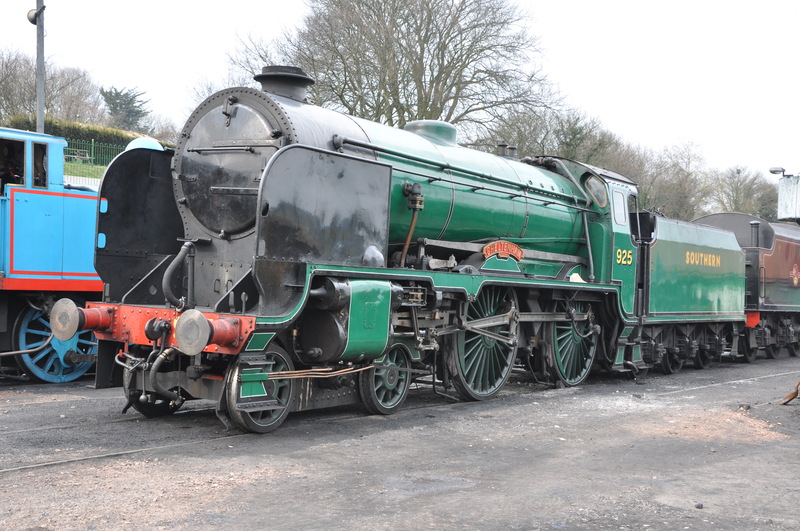 The original will be rebuilt and stored. The gearbox was found to be in good serviceable order and was subjected to a thorough clean and the clutch was treated to a new kit. Right at the beginning of Fleet News I mentioned that my MG BGT had been somewhat neglected and relegated to something of a last priority. However, slowly but surely in the last few months the car has been brought back to its best. It was high time I clocked up a few quality miles in the vehicle that was once my everyday classic. So, in pursuit of this I decided to take her on a three day ramble around Southern England. Our tour started in earnest with a visit to the REME Museum at Arborfield Camp. Highlights for me were the vehicle collection (predictably) and the gun/small arms collection. Never before have I found myself surrounded by such an amazing range of weaponry in such a small space. The collection included rifles, pistols and revolvers, machine guns and infantry support weapons, some exhibits dating back hundreds of years. There is much to take in at this museum about REME’s role past, present and future and I would strongly advise you to allocate a good few hours when visiting. We then motored down the A30 and into the Test valley, passing through Hurstbourne Priors, Longparish and Wherwell, enjoying these stunning places with their charming character and well maintained buildings. We stopped for lunch at the Mayfly, a delightful pub/restaurant sitting right on the River Test as it babbles its way south through the Hampshire countryside. We then charged over to Ropley on the Watercress Line. It was late in the day and we were hoping to have a peek inside the restoration shed. As it turned out we had arrived at the perfect time as the locomotives were just being put away for the night. I will never tire of being at close quarters to the great steam locomotives that majestically pounded up and down the iron highways back in the glorious days of Industrial Britain. Everything is big, heavy and beautifully made and even when gently rolling to a halt after a solid day’s work on the Mid Hants, the atmosphere and presence of these magnificent machines is incomparable. On this occasion we were privileged to be in the company of Schools class ‘Cheltenham’ and Lord Nelson Class ‘Lord Nelson’. One of the chaps in the shed finishing off his work was very friendly and happy to answer our questions. Climbing back into the MG BGT I felt a glow of joy knowing that the era of the BGT began when a handful of these steam engines were still clanking around the network still providing sterling service at the head of a local passenger service or goods train. Magnificent! Enjoying those thoughts we motored South into the New Forest and onto our hotel for the evening, the Master Builders Hotel at Buckler’s Hard. As is traditional on such trips the ‘Commander’ (my travelling companion) and I, inspired by fine British machinery and stunning British countryside, had a decent meal and a glass or two of fine local ale while putting the world to rights which, let’s face it, inevitably involves rectifying the appalling damage wreaked on these Islands by the shockingly bad governance of Britain, predominantly over the last twenty years, though the seeds were sewn many, many decades ago. The Maritime Museum at Buckler’s Hard gave us a fascinating insight into the history of this 18th century shipbuilding village focusing on its vessels including those built for Nelson’s Navy. I knew next to nothing about how those glorious wooden ships were constructed and launched and was utterly staggered at just how involved and labour intensive a process it was. Well worth a visit. 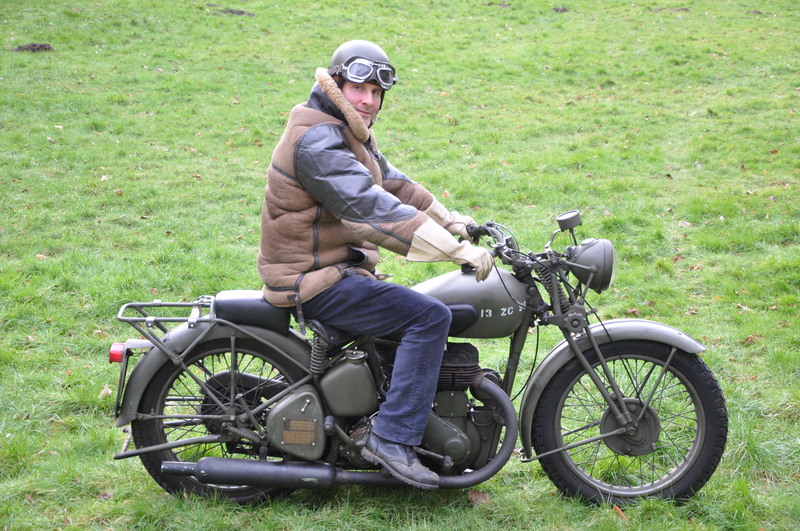 We then headed west to New Milton and Sammy Miller’s Motorcycle Museum. 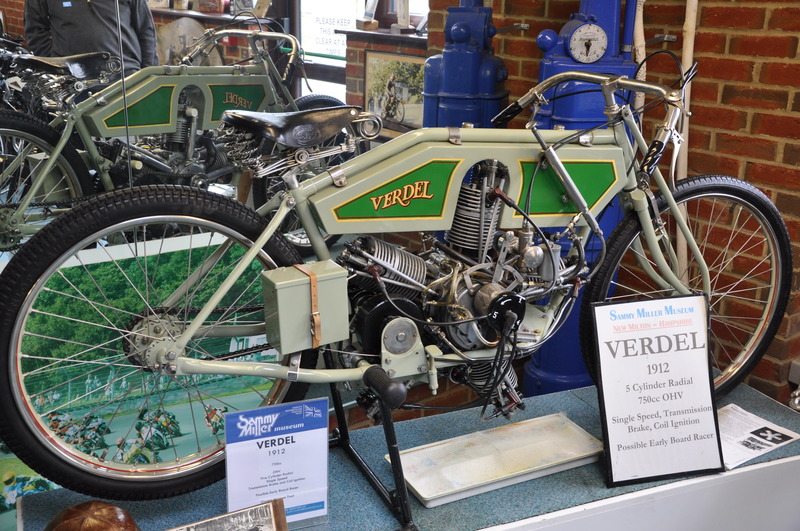 Once again, you would be advised to allow a good few hours to enjoy this one because with over forty machines on show, all aspects of motorcycle history are covered in great detail. I have loved old bikes for most of my life and still I never fail to be amazed by the variety of designs and engine configurations that can be applied to a two wheeler. When I visit this museum one thing always amuses me. Never more than a few seconds are allowed to elapse before you are once again reminded that the man behind it is Mr. Sammy Miller. There are simply a bewildering number of pictures featuring the great man – either in action or grinning happily astride a machine or alongside a dignitary. And quite frankly, so there should be, because Sammy has put together a peerless collection of living motorcycles in a superb setting. I shall be visiting again! We then motored on towards Bournemouth and on our way to the Sandbanks – Swanage chain ferry, I managed to clap eyes on some of the properties that have apparently made Sandbanks one of the most expensive areas in Britain. Some of these buildings are quite frankly hideous and once again confirm the old adage that you simply cannot buy taste. Having spent so much time at Sammy Millers Museum we decided to press on through Dorset and head for our hotel in East Devon. It was during this afternoon that we encountered the worst weather of this trip with steady rain accompanying us all the way along the A352 and 35. There was quite a bit of concentrating required here as the BGT’s wipers don’t sweep the screen as effectively as they should to be honest but we nevertheless pulled into the family run Hunter’s Moon Hotel in Sidmouth in perfect time to sample the local ale brewed a few miles up the road at the Otter Brewery. I was gently dug-dug- dug-dug-dugging along on the M20 the other day when I encountered something of a transmission problem. I had just turned off a main A road in semi-suburbia and had toed the old warrior into third when some unfamiliar and frankly unwelcome noises started to emanate from down below. The main din was a sort of whiney buzz. I began to picture worn splines and broken bits of cog being hurled around the box causing major damage. First gear seemed to be working ok so I limped home very very slowly and of course completely ignoring the workshop manual advice of ‘stop the engine immediately and investigate the problem’. There must be a God out there because it was just after I had actually reached home that I finally lost first gear and consequently any kind of forward propulsion at all. After a brief demo of what happens (or not) when a gear is engaged plus some observation of noises from within, mechanical guru Paul and I rolled the M20 onto the lift. We inspected the selector mechanism and discovered that it was in fine fettle and performing its cog shifting role admirably. 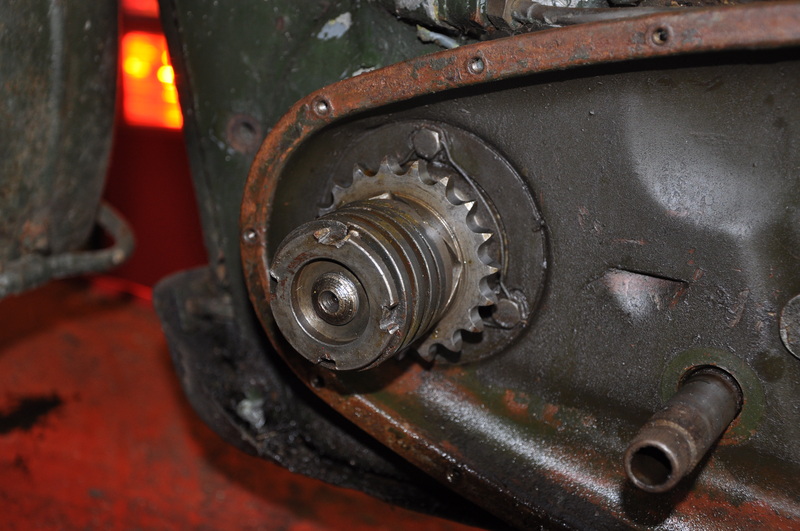 We also had a little look inside the gearbox and found that to be in decent health. Our next step was to remove the primary chaincase cover and have a peek at what delights awaited us there. Low and behold, it was immediately noticeable that the retaining nut on the end of engine shock absorber was in such a state of looseness that it was apparently trying to drill its way through the chaincase cover. Said nut is now tight and M20 is once more a machine with (sort of) silky smooth gear changes. Time to get back to dug-dug-dug-dug-dugging! 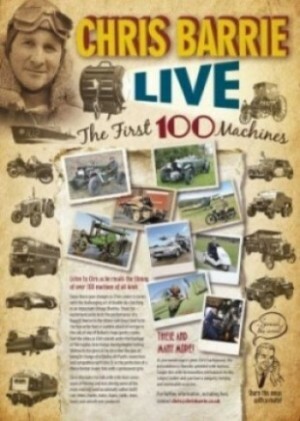 In recent months much time and effort has been expended on preparing motorcycles for the road. A few machines have merely required some air in the tyres and a change of oil and others have required slightly more involved work. 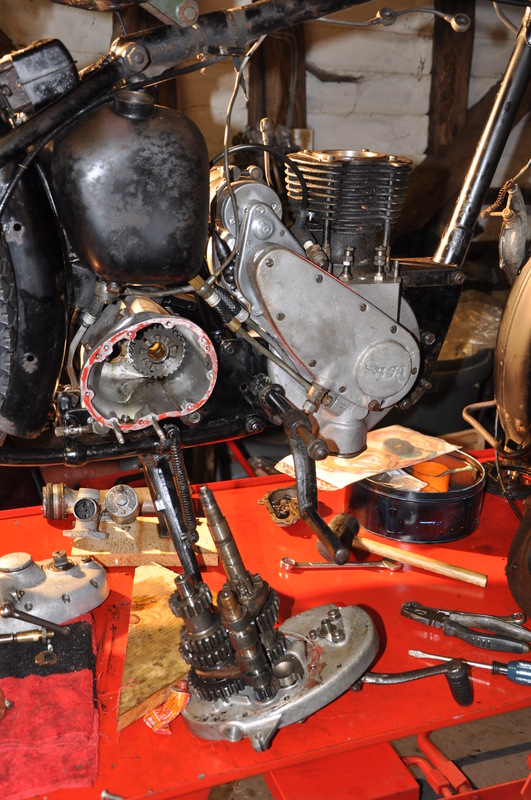 In the latter category we find a ’52 BSA B31 Plunger which, on the face of it, was a candidate for full restoration. However I have decided to put it back into service in ‘oily rag’ condition- mechanically sound but in seriously ratty, beaten up condition- something of an anti restoration protest! As far as I’m concerned, while there is a place for genuinely sympathetic restorations, bikes and cars that have had their soul removed and been transformed into items of over restored bling are a big no, no! This B31 Plunger had a seized engine but after several applications of heat, little by little, we carefully freed the piston, inspired by the sight of the piled arms stamp on its crown. Yes this machine is on its original standard bore, and most of the nuts and bolts are in excellent ‘virginal’ condition. Where possible we have bent back and cleaned up the original Made in England parts and tried to avoid using new bits- tyres, rubbers and wiring are an exception of course. At the moment we are having fun and games with the carburetion and ignition timing but hopefully soon tatty ratty will take to the road. So here it is, now with new Dunlop RS5s (they were always the favourites! ), proper Mark VII wheel spats (actually Mark 8/9 spats modified by George King ‘s excellent team at TVR in Maidenhead). 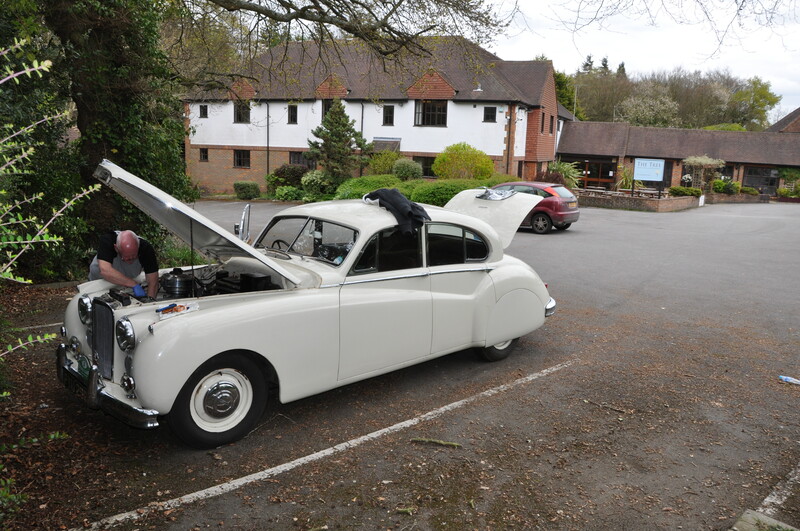 However, a lot of work has been done since February 2011 – front and rear brakes have been rebuilt with skimmed and repaired drums (one of these had a rather interesting hole in it) relined shoes, new brake pipes and replacement flexis. Front suspension components have been cleaned and repainted, front hubs have been replaced, the anti roll bar brackets have been straightened, the steering box has been overhauled, track rod arms have been replaced and the front stub axles and seals. Shock absorbers front and rear have been replaced and the back axle has been rebuilt with replacement wheel bearings and inner and outer half shaft seals. A universal brake servo has been fitted. 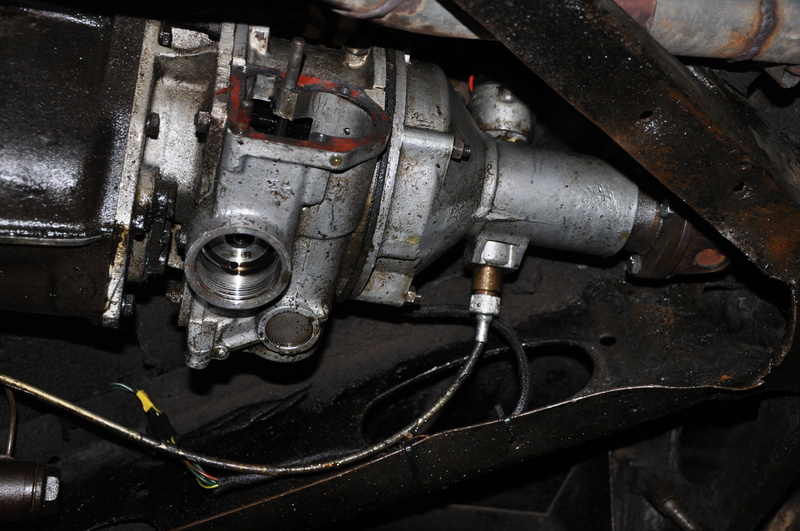 Brake and clutch master cylinders have been replaced as has the clutch slave cylinder. Engine mounts have been replaced. The prop shaft has been overhauled with replacement centre bearing and mounts. Fuel pumps have been replaced and rewired and new fuel pipe with an inline filter has been fitted. The carbs have been overhauled. New thermostat and housing has been fitted and the car has been rehosed. The distributor has been overhauled. New HT leads have been fitted. The exhaust manifolds have been replaced and a new full exhaust system has been fitted. Although this isn’t as standard, it makes the car sound absolutely fantastic. With the car now ready for its first test run, I was beginning to think that an MOT certificate could be a reality. However, on test , there was head gasket failure. Due to the existing head being beyond economic repair a replacement cylinder head has been fitted and the Mark VII is now running well. A big thanks to Marcus and Tom Barclay for just about all of the mechanical work that’s been done. 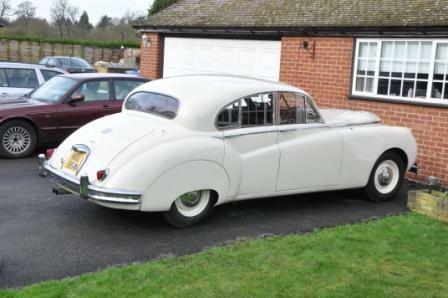 Having recently refurbished another Mark VII, Marcus, if he wasn’t before, is most certainly now an expert on all things Mark VII !! The car with its fresh MOT certificate will now be driven as often as possible in the coming months to see if any other gremlins surface and then I shall begin thinking about phase two- The Body…. It’s true, I simply wanted the car tuned and serviced in preparation for some outings and rallies this (so-called) summer and after a thorough inspection by conscientious mechanic Conrad, nearly all mechanical systems apart from the actual engine and gearbox have been treated to a re-build incorporating a thorough clean, a lick of paint and a whole host of replacement parts. One thing I didn’t think I would end up doing is replacing the E-Type’s engine frames. To be honest, before I was shown a few small rust holes in the existing frames, I knew nothing about them. Briefly, the original frames were made out of Reynolds 531 tubing and were only designed to last for a few years – not a few decades. Given that the existing may not be original and were fitted during the cars restoration in the 1980′s, they are still the best part of three decades old. So, a call to the highly recommended E-Type Fabs Ltd in Darlington (Tel: 01325481819) and an order was placed for a brand new set of frames, fabricated from the modern and apparently stronger version of Reynolds 531 tubing. Colour matched and superbly painted by Thames Valley Repairs Ltd in Maidenhead (Tel: 01628781717), they were finally bolted onto the bulkhead and slowly but surely E-Type has been reassembled and prepared for the road. Lets hope that we are treated to more than 16 minutes of dry weather this summer because frankly most classic car owners and event organisers are finding the weather rather frustrating! Come what may – rain, hail or sunshine, the E-Type will definitely be going to the Goodwood Revival this year…. Happiness is mucking about with an old tractor. 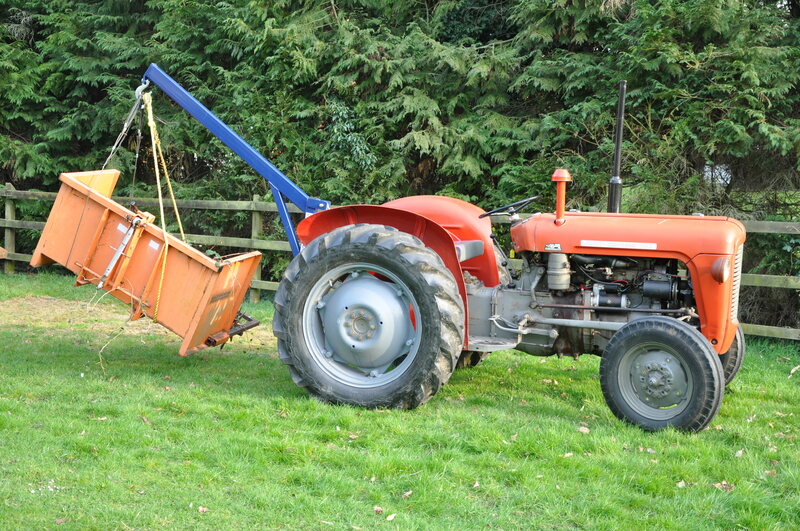 If you need a dose of relatively inexpensive mechanical therapy, then acquire for yourself an old tractor and a few implements and start lifting, carrying, ploughing, collecting, digging, sawing – to name but a few. In this case, it is something of a time warp ’64 Massey Ferguson 35X with low hours. Going mowing with a set of Ransomes gangs (expertly rebuilt by Jim Upson and his team at Upson Mowers in Maldon, Essex – Tel:01621 892907) makes cutting grass an utter pleasure. Frankly, there is little to compete with parking your lug ‘oles next to that exhaust at about 1500 rpm and reveling in the joyful throaty roar of the 3 cylinder Perkins diesel with the mowers snipping away in the background- Heaven! If I were to pop a pound into the fuel fund of the 4-Litre-R every time someone said to me ‘it costs over eighty quid to fill my tank now’, that fund would cover the Princess’s thirst for quite a lengthy continental tour. Yes, petrol is expensive. Irritatingly, much of what we’re paying is fuel duty. I don’t think I’m being over controversial when I say that this duty is a ‘green tax’, a tarnished notion if ever there was. The leftie/liberal tree hugging lobby, so powerful in government circles, seems to have convinced the political elite that ridding our roads of fossil fuelled vehicles would be a big step towards ‘saving the planet’. That, of course, is poppycock and more and more experts are coming out of the woodwork and expressing the view that global warming is cyclical and mainly due to the activities of that big orange thing in the sky that can give us a burnt nose if we forget our tweed caps while roaming the countryside in our roadsters on a summer’s day. Frankly, despite the present government making noises about it, there doesn’t seem to be much sign of the creation of a fair fuel policy. If anything, there is a definite sense that the motorist will be continually clobbered from every angle possible – mainly in the form of congestion and parking charges, speed cameras and increased road tax. And it isn’t as if these taxes contribute to the improvement of our roads and transport infrastructure generally. No, this is just a means of extracting more and more cash out of the beleaguered motorist who may already be struggling in a difficult financial climate anyway. There are moments in my life when I see some green zealot/hyper fascist appearing on our TV screens and broadcasting to the nation in doom laden tones, ‘Classic fossil fuel powered vehicles shall only be allowed on the public highway for three hours per year and for a maximum of 12 miles and for this privilege the owner will be charged a reasonable fee of £5000. Otherwise, these machines should be locked away in a sealed storage facility, so that their oily, petrolly oldness does not contaminate the earth. Should any of our inspectors detect the merest whiff of longbridgy classic cowleyness, owners shall face fines of up to £100,000!’ Then I spring upright in a cold sweat and moan with gratitude that this has only been a nightmare. Well, I hope I am wrong but I fear it may only be a matter of time before the historic vehicle movement is specifically targeted by…. Guess who? Yes, you’ve got it, that wrecking ball for our economy and culture, that faceless bunch of overpaid bureaurocrats known as the European Union. And as you are probably all well aware, it doesn’t matter who holds the balance of power at Westminster. Whether it’s the alleged labour party, the con-artists or the lib dims, they are all unpatriotic and appear to want to carry out to the letter anything the unelected commissars of the Fourth Reich, sorry I mean the EU, decree. Interestingly, there is a Parliamentary classic car club. We can only hope they love their vehicles as much as we do and that they can convert that passion into some form of clout. But I digress, the fact remains that with the general trend of fuel prices heading in only one direction, it seems that most of us will be in a position to use our more thirsty classics less and less frequently. I choose to look at the situation from a different and more optimistic angle. 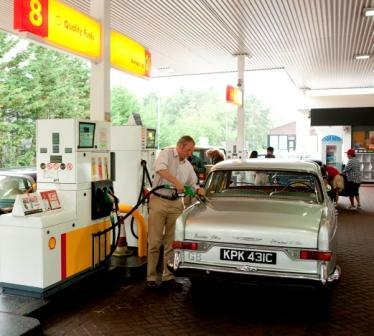 If you are as passionate about classics as I am (I’m sure most of you are,) a gallon of go-juice in the tank of your favourite gas guzzling classic is still actually great value. Let’s consider a fifteen mile meander in the 4-litre-R. For that distance you would use up about a gallon of petrol which is very nearly £6’s worth. At an average speed of 30mph, that would be a rather pleasant way of spending half an hour. So, what other ways are there of spending £6 in half an hour? A lunchtime cookery class perhaps? Messing about in a pedalo on the Serpentine? A cash gobbling blast in an amusements arcade maybe? Or what about a rapid couple of pints of good ale in your local hostelry (if you still have one)? For me, the drive in a rolling piece of motoring history would easily win the day, every time. In a transaction which involved swapping a BSA Rocket Gold Star ‘replica’ plus some cash for a 1965 Princess 4-Litre-R ‘with history’, it is difficult to know which party achieved the best deal. However, having considered the car’s provenance and overall condition, I am happy to say that I feel quite privileged to be the current guardian of this interesting vehicle. 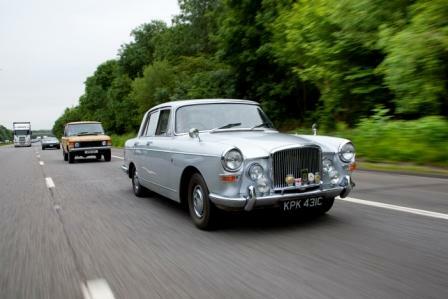 Directly replacing the ageing Princess 3 Litre Mk 2, the Vanden Plas Princess 4-Litre-R, announced in August 1964, was the embodiment of a technical collaboration between BMC and Rolls-Royce, designed at giving both organisations a new stake in the luxury car market. 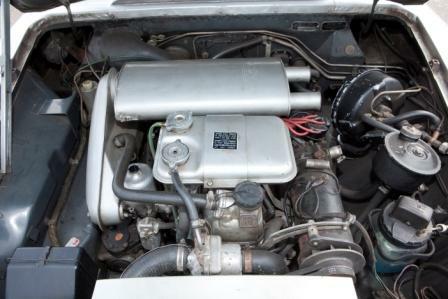 Essentially, the car consisted of a Rolls-Royce six cylinder engine (FB60) developed from its range of military engines and fitted under the bonnet of a re-worked Mk2 hull. Whether it was down to unreliability or the car’s identity crisis leading to buyer disappointment, after an initial surge, sales declined rapidly and production ceased in 1968. 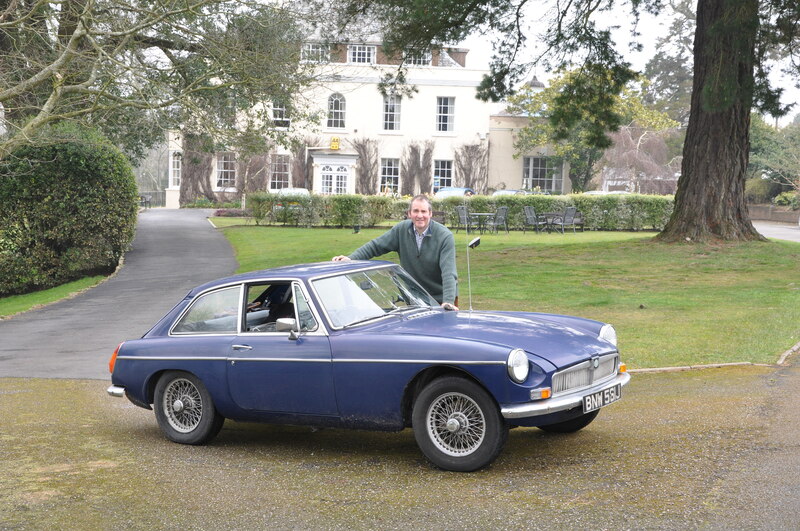 This particular car is the only example made in medallic grey and it was owned by Col. Arthur Waite, ex racing driver, former BMC board member and indeed son in law of the great Lord Austin. There is most certainly a time warp feel about the car and I don’t believe it has ever needed a full restoration. Sitting in the driver’s seat there is a strangely powerful ambience that makes me feel almost spiritually connected to the soul of the British motor industry. Although there have been a couple of owners between myself and Col. Waite (who died in 1991 in his 97th year), it sometimes feels as if the car still belongs to him. What musings and discussions has this vehicle witnessed and what secrets will it never divulge? Of course, my thoughts inevitably turn to whether he considered the joint BMC/Rolls Royce venture to have been a wise idea. And more specifically, how did he like driving the 4-litre-R? I think it is safe to say that he found it rather different to the supercharged Austin 7 in which he won the 1928 Australian Grand Prix! As perhaps one would expect, the Princess’s interior oozes ‘joint venture’. 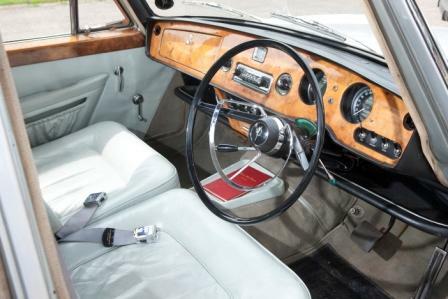 The seats, auto box selector and deep set instruments are very Rolls-Royce, while the large steering wheel and switchgear are definitely BMC – right down to the Morris 1000 indicator stalk! Overall, despite the cut price Rolls element, the airy cabin is an extremely comfortable place. I have some experience of Rolls-Royce and Bentley motor cars and compared to the six cylinder motor in a Silver Cloud 1 or its V8 successor in the Cloud 2 or 3, the FB60 is certainly less quiet. This is no bad thing of course as the sound of an engine is one of the key factors in the enjoyment of things mechanical. To be in the presence of the FB60 as its beefy growl develops into a steady purr is quite a joy. On the move, the 4-litre-R is definitely happier on motorways and big, straight roads and felt as if it could cruise all day at the legal limit with plenty more on tap if required. These are early days in our courtship and I am still becoming acquainted with the Princess – the jaunt to Calshot and the National Motor Museum with the Practical Classics team was the first time we have covered any meaningful distance. If I were to sum up my early findings, I would have to say that the dominant manifestations at the beginning of the day were BMC and military vehicle but the further and faster we travelled together, the more the Princess became a Flying Lady. A few years ago I contributed to Practical Classics magazine’s Staff Sagas and shall be sending further updates in the coming months. Fleet News on this site is a more detailed account, reporting on the same four cars plus a pair of contrasting newcomers. 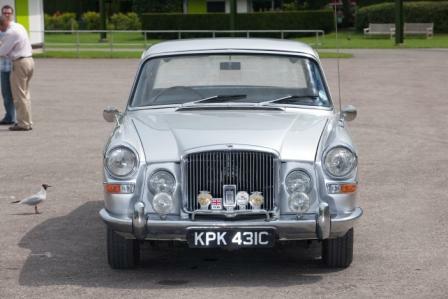 Any XK engined Jag saloon is a thing of joy, but the king of them all is the Mark VII. For me, not only does the VII (and the VIII/IX) represent the first of a long line of great saloons, it has something more than the usual package of style, comfort and performance. 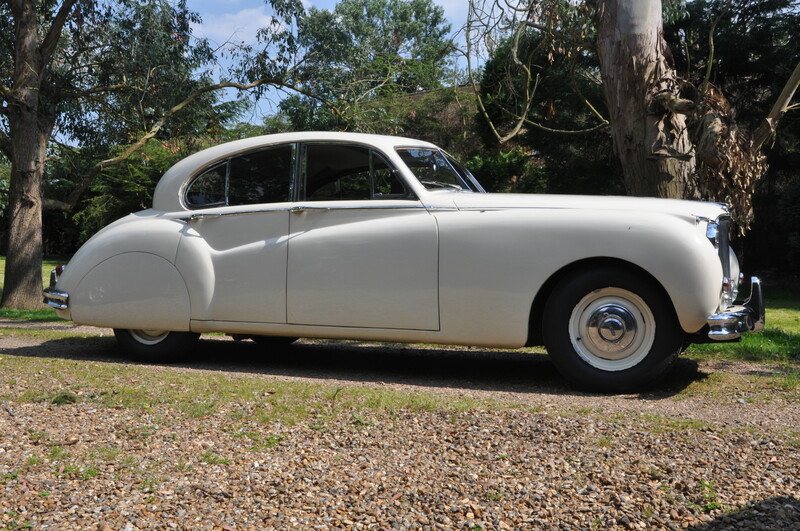 A Rolls/Bentley like presence coupled with an aggressive feline stance gives the VII an inimitable cool grandeur and subsequent Jag saloons of more progressive design missed out on this. Unlike a Rolls/Bentley however, the Jag is equipped with the masterpiece that is the XK engine – fundamentally this is a 100mph club room. Sink into that armchair and watch the world rush towards you over a vast acreage of beautifully sculptured wood veneer. Between the VII, VIII and IX, the earliest vehicle is the most aesthetically pleasing – full spats, a split screen and no fussy chrome strips down the flanks. The car we’re concerned with here is a Mark VIIM, distinguishable by its flashing indicators, wrap around bumpers, built in horn grilles and fitted fog lamps. Power was also up to 190bhp, a 30bhp increase on the VII. This car needs quite a lot of work to bring it up to a decent usable standard. 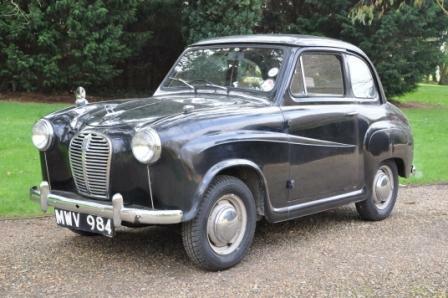 I have been intrigued by the Austin A30/35 for decades but never thought I would ever own one. However, an acquaintance of mine in the classic motorcycle business took an original but slightly tatty, low mileage ‘55 A30 in part exchange for some bikes (because it was small enough to take up little space in his shed) and suggested that I should have it for a reasonable amount of blue folding. So in this era of austerity, which looks like it will hang around for some time yet, I suddenly have the perfect car. After a brake overhaul, Piglet was awarded a crisp new MOT and off we went. Interestingly the car came with 135/70R13 radials, and given that an A30 is something of a buzz box anyway (this ‘55 car has a diff ratio of 4.87), the small tyres contributed to even lower gearing. The new budget 155/80R13 radials make the car look much better and 45mph cruising is acceptable. However, at 50mph plus I tend to feel a tad uncomfortable with the frantic rate at which the innards of the little 803cc A series are moving. I am aware that there are a few more ways of raising the gearing (get an A35) and indeed the power (get an A35). However, I think I am happy to keep Piglet original and enjoy her in all her trafficatory splendour as an ultra local hack. Next on the cards will be some wax oiling and attention to that interior. 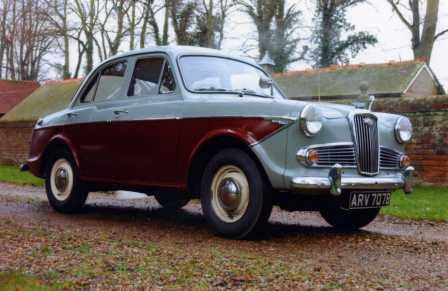 Of course a popular way of upping the gearing of an A30 is to change to a 3.7 diff from a Wolseley 1500. Well, just now I am happy to leave the 3.7 Wolseley 1500 diff attached to the Wolseley 1500, because I am 90% certain that Wolseley is but a battery charge and a leak free radiator away from returning to the front line on those short medium haul duties it does so admirably. The 1500 has also been earmarked for the odd rally this year so all systems will need to be working well. The TR2 hasn’t been out to play since it took part in PC Magazine’s TR fest which saw 11 TR’s roar up to North Wales via what remains of the former Triumph factory at Canley. Although this is now a hideous fast food and retail park or some such, it was quite a special experience to stand with TiaRa outside the social club (the only remaining original building) and consider that when (Great) Britain was a proper country, these wonderful motor cars were built right here on this site. For bringing her ‘home’, TiaRa rewarded me with 400 miles of impeccable behaviour. I did get rather wet, but that was my fault for not bringing any side screens. The ‘2’ has been treated to a wash and a short blast around the lanes. All seems to be okay, but in the coming weeks she will receive a well deserved full service. 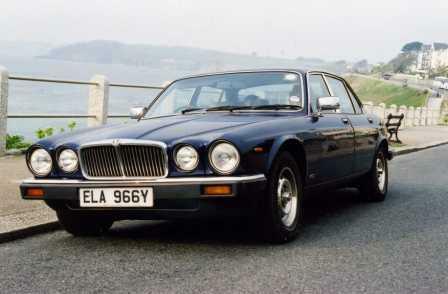 Unlike the A30, the 4.2 litre Jaguar XJ6 is not an ideal hack for these austere times. Having said that, it shall be rolled out for duty on occasional long distance express runs, the type of journey it does rather better than just about anything else. Recently, on a couple of occasions it has manifested a reluctance to start when warm. I shall be monitoring this closely in the coming weeks. 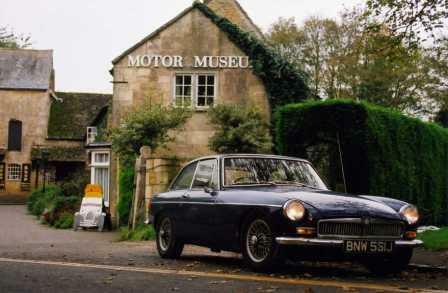 There is no doubt about it, the MGBGT has been neglected. As it is a heritage body shell car built in the early 21st Century I tend not to feel too guilty about making it last priority. However, it remains in the plan and will be re-commissioned as a fun, everyday, mainly winter hack. Carbs and some fairly important but irritating issues like temperature gauge and heater controls need sorting.